James Hunter in Concert Three discs into his career, James Hunter released his 2006 album People Gonna Talk to an international audience, earning a Grammy nomination in the process. Hunter has come a long way from his beginnings on a London street corner two decades ago. Hear Hunter perform a concert from WXPN and World Cafe Live. 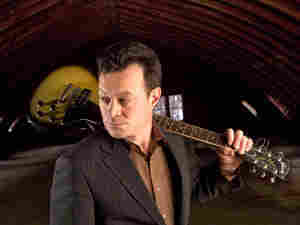 "Don't Do Me No Favours"
Three discs into his career, James Hunter released his 2006 album People Gonna Talk to an international audience, earning a Grammy nomination in the process. Having opened for the likes of Aretha Franklin, Willie Nelson, Etta James, and Van Morrison, Hunter has come a long way from his beginnings on a London street corner two decades ago. Click the link above to hear Hunter perform a concert from WXPN and World Café Live. In his new album, The Hard Way, Hunter delves even deeper into soul, fusing his smoky voice with the sounds of surf music. With nods to American soul legends such as Sam Cooke and Ray Charles, Hunter maintains a sense of nostalgia, while infusing his sound with modern style and distinctive technique.